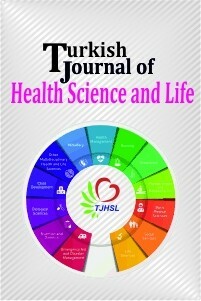 I am honored to invite you and your valuable studies to the Turkish Journal of Health Science and Life. The main aim of our journal, which started its publication life in 2018; is to contribute to establishing and strengthening the relationship between practice and theory with support from you, as well as providing an environment in which occupational effectiveness is shared and evaluated among academicians working in the field of health sciences. In our Multidisciplinary Health Sciences and Life-oriented journal; we look forward to seeing your scientific work in the fields of Internal and Basic Medical Sciences, Nursing, Midwifery, Nutrition and Dietetics, Child Development, Physiotherapy and Rehabilitation, Biological and Life Sciences and Multidisciplinary Health Sciences. - Research article: An article written in scientific format that presents original researches and results. - Review: Comprehensive compilation of scientific studies mainly on recent literature in a particular subject. - Case Report: Evaluation of interesting cases on a specific topic. The Journal of Health Science and Life is an international journal, published three times a year. The International Journal of Health Science and Life Every article; is evaluated by at least two arbitrators selected from independent domestic or international referees on the basis of independent, unbiased, double-blinded arbitration. If the submitted article conforms to the formal guidelines, it will be published after the editor and the scientific committee have examined and, if necessary, made the required changes. None of the authors can be deleted from the authors' list without the written consent of all authors, and no names can be added as authors and the authorship sequence cannot be changed. The authors agree to make editorial changes by not making any fundamental changes in the texts accepted for publication. All transactions of the magazine are carried out in electronic environment via internet. Transactions are carried out through the "Dergi Park" system using "username and password". Our journal is almost a showcase of the products of our professional group. I thank you in advance for your contribution to the beauty of this showcase, I offer respects.